It's not a showstopper but Apple also announced a small updated for its Mac mini. The Mac mini retains its metal puck shape, but Apple has updated the internals with Intel's latest 4th generation Haswell Core processors. On board, there's also integrated Intel HD Graphics 5000 and Iris graphics, which Apple promises to deliver up to 90 percent faster graphics performance than the previous generation Mac minis. Apple is calling the new Mac mini the world's most energy efficient desktop and it comes with the latest 802.11ac Wi-Fi standard plus two Thunderbolt 2 ports. 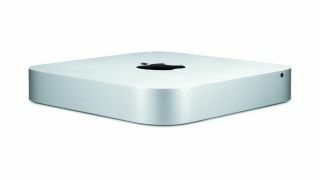 The Mac mini starts shipping today for a newly reduced price starting at $499 (£399, AU$619). The starting specification comes with a 1.4 GHz dual-core Intel Core i5, 4GB of memory, Intel HD Graphics 5000 and a 500GB hard drive. Stepping up to the $699 (£569, AU$869) model, this higher-end machine affords users a faster 2.6 GHz dual-core Intel Core i5 processor. This mid-tier machine also comes with double the RAM and storage space plus Intel Iris Graphics. Lastly the highest end Mac mini is equipped with a 2.8 GHz dual-core Intel Core i5, Intel Iris Graphics, plus 8GB of memory and a 1TB Fusion Drive for $999 (£799, AU$1,249). Every new Mac comes with a shiny new copy of OS X Yosemite, check out our review.